K's Coast Condo is a beautifully decorated ground level condo in the Rockport Racquet and Yacht Club. You will definitely get the coastal feel while staying here. Have you ever dreamed of waking up after a great nights rest, walking outside, and feeling cooling bay breezes against your skin all while looking at the beauty of a seemingly never ending body of water? At K's Coast Condo you can make that vision and many more a reality. This coastal condo is on the first floor of the Rockport Racquet and Yacht Club on Fulton Beach Rd. Sleeping up to 6 people, this home is perfect for a fun vacation with family or friends. Enjoy the weather at the communal swimming pool or take a stroll under the old live oak trees. Little Bay is right across the street which means with only a short walk you can enjoy breathtaking waterfront views and fresh coastal air. The master bedroom has a king size bed and a private bathroom. The second bedroom has a queen size bed. There is a queen size sleeper sofa in the living room sleeping 6 people comfortably. K's is pet friendly but is limited to dogs only, and 20 lbs or less. The kitchen is fully equipped with all the comforts of home. Ice maker, dishwasher, etc. Enjoy sitting on the shaded back porch that faces the swimming pool and views of the very well maintained grounds. There is a charcoal grill and patio furniture on the back porch. Please keep in mind that it will take some time to rebuild the amenities on the complex grounds. We cannot guarantee cable services or internet services due to repairs of damages after the storm. 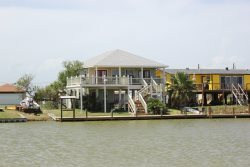 We love Winter Texans and we welcome them to spend the winter months at K's Coast Cottage! Kittys staff was very friendly, knowledgeable, and accommodating! As always friendly, professional and courteous. Our family loves the condo. We have stayed at other places in Rockport before, but Miss Kitty's is the best. The most enjoyable vacation we had. The staff were excellent. They were friendly, knowledgeable and eager answer questions and concerns. As always a top notch company to rent from. We enjoyed our stay and utilized the amenities. The few minor issues didn't hinder our fun vacation, however in all honesty I would have given all excellent and full stars if the towels and blinds were different. Communications with the team were outstanding! Check-in instructions were clear and complete. Although we didn't need to contact them during our visit, I'm confident they would have been responsive to our needs. We've stayed at three other locations in the Rockport/Fulton area and this was by far the best. We had plenty of room to spread out and enjoyed having a parking spot right outside the front door. Will definitely try to rent this condo again on our future trips to fish in the Rockport/Fulton area. This was actually my first experience renting a condo. The paperwork was a bit unnerving honestly but I understand that everything has to be in writing to protect the company and owner. The questions I had were answered very promptly and I really appreciated that and our over all stay was fabulous. I can't even express how much we enjoyed it. The people who e-mailed me were absolutely wonderful and we thoroughly enjoyed every minute.